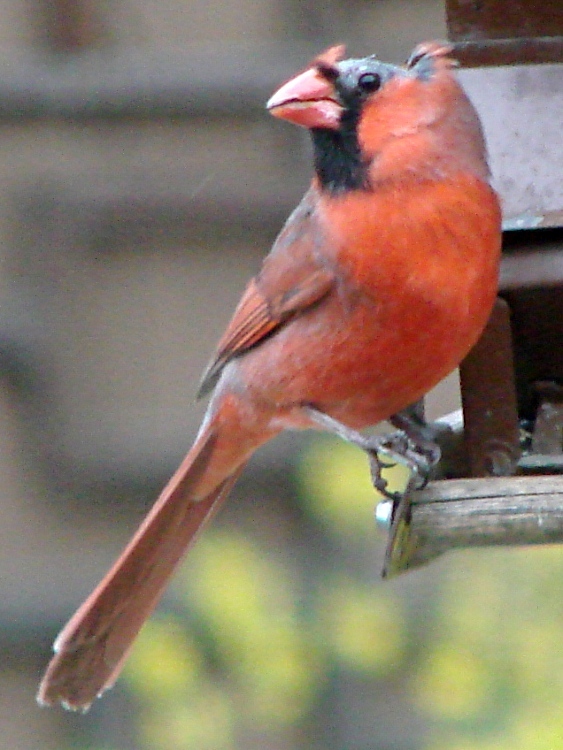 The bald cardinal still stops by the feeder in the evening. He’s now losing the smaller red feathers around his eye and above his beak. The black feathers bordering his beak seem unaffected, although it’s hard to tell through the window glass blur. This image is a tight crop from the Sony DSC-H5, which has a lens about two stops faster than my Canon SX230HS pocket camera and is much better suited for evening photography. I’ll add the tele adapter to the stack and try to get a better picture from the door; I think the autofocus assist light spooks the poor bird.